In Volume I, several illuminating attempts to define empathy are followed by Kohut’s essay, ‘Introspection, Empathy, and the Semicircle of Mental Health.’ Kohut’s paper, in turn, ushers in a series of original contributions on ‘Empathy as a Perspective in Psychoanalysis.’ The volume ends with five papers which strive to demarcate an empathic approach to various areas of artistic endeavour, including the appreciation of visual art. Volume II continues the dialogue with a series of developmental studies which explore the role of empathy in early child care at the same time as they chart the emergence of the young child’s capacity to empathize. In the concluding section, ‘Empathy in Psychoanalytic Work,’ contributors and discussants return to the arena of technique. They not only theorize about empathy in relation to analytic understanding and communication, but address issues of nosology, considering how the empathic vantage point may be utilized in the treatment of patients with borderline and schizophrenic pathology. Joseph D. Lichtenberg Acknowledgement Part 4. Developmental Aspects of Empathy Donald Silver Introductory Remarks 15 Virginia Demos Empathy and Affect: Reflections on Infant Experience 16 William S. Condon Communication and Empathy 17 Anni Bergman and Arnold Wilson Thoughts about Stages on the Way to Empathy and the Capacity for Concern 18 Elsie R. Broussard Maternal Empathy: Its Relation to Emerging Self-Representations and Empathy in Infants Part 5. 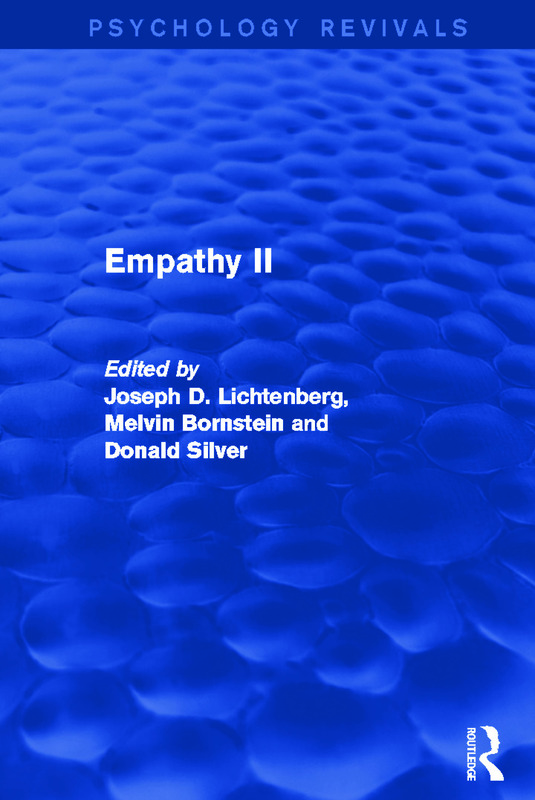 Empathy in Psychoanalytic Work Melvin Bornstein Introductory Remarks 19 Joseph D. Lichtenberg The Empathic Mode of Perception and Alternative Vantage Points for Psychoanalytic Work. John E. Gedo Discussion 20 Evelyne Schwaber Empathy: A Mode of Analytic Listening. Merton M. Gill Discussion 21 Herbert J. Schlesinger The Process of Empathic Response. Alan Z. Skolnikoff and Mardi J. Horowitz Discussion 22 N. Gregory Hamilton Empathic Understanding. John J. Hartman Discussion 23 René Major and Patrick Miller Empathy, Antipathy, and Telepathy in the Analytic Process. Stanley A. Leavy Discussion. René Major and Patrick Miller Noise: A Reply 24 Bennett Simon Confluence of Visual Image Between Patient and Analyst: Communication of Failed Communication. James C. Skinner Discussion 25 James H. Spencer and Leon Balter Empathy and the Analyzing Instrument 26 Ping-Nie Pao Therapeutic Empathy and the Treatment of Schizophrenics 27 Bernard Brandchaft and Robert Stolorow The Borderline Concept: Pathological Character or Iatrogenic Myth? Gerald Adler Discussion. Bernard Brandchaft and Robert Stolorow Reply. Author Index. Subject Index.